A Thomas John Massey was mentioned in the book” Soldiers Died in the Great War, Royal Welsh Fusiliers, Volume 28″, and from that we have his regimental number etc. and it tells us he was born in Queensferry, Cheshire (sic) enlisted in Shotton, 20143 Pte. Killed in Action, France & Flanders 10th July 1916. This was the only clue to this soldier as there is no Flintshire WW1 Index Card for him, and I cannot find any Service Records for him either, so any information would be greatly appreciated. But then, I found Thomas remembered on the Sandycroft War Memorial in St. Francis’s Church Sandycroft and the Roll of Honour for the Queensferry Chemical Works*, where his cousin Ernest Massey was also mentioned, but he survived the war. *This is in the Flintshire Record Office at Hawarden. Thomas J. Massey appears on the 1891 census, age 4, living in Queensferry, 5 houses from the Hawarden Castle Hotel, his father Thomas Massey was head of the household, 25 and a Cooper, born in Queensferry. His wife Sarah, 25, had been born in Connah’s Quay and I believe that they may have married in St. Mary’s Church Chester in 1885 (Cheshire West CE14/9/365), if this is the marriage Sarah’s maiden name was Hewitt. A little sister Pricilla (sic) was also in the household, age 2. Priscilla, age 12, does not appear with the family on the 1901 census, she, I believe, is a Domestic Servant for John & Hannah Carver and their son Edward at Rectors Farm, Northop. I believe that his death certificate may be (Flintshire (Mold) HAW/27/73). His certificate would have to be purchased to prove/deny. Many thanks to Thomas’s descendant, Terence Poyner, who also told me that the family story was that Thomas John was a Cooper in the above works, and he was a fireman in their fire brigade. He was also a sniper and he died on the Somme. Thomas J’s brother Walter was also in the war, but survived, and he was awarded the Military Medal. Hello Mavis Thanks for all your efforts. Just to add to what you put down regarding Tom and Walters sister , Priscilla. She married a Daniel Barratt at Huyton in 1907 and on the 1911 census she is living at 12 Ashfield Rd Shotton with her husband Daniel and 3 children viz Tom (3) Charlotte (2) and Gladys May (3mths) I have found the birth entries for Charlotte and Gladys but not Tom. Sadly Priscilla died in the Dec qtr in 1911 aged 22. I think she had a short probably hard life. Spare a thought for her mother Sarah. She had been widowed aged about 33 with all those children and then was to lose Priscilla and Thomas at a very early age. Sarah is now a widow on the 1901 census, age 36, a Laundress (Wash) on her own account at home, was living at 9, Chemistry Cottages, Queensferry, Hawarden, Flintshire with her sons Thomas J. Massey, 14, a Cooper’s Apprentice and Walter, 6 with daughters Mary E., 9, Marie, 3 and Lizzie H. 1. The 1911 census tell us the family was living at 6, Church View, Pentre, Flintshire, Sarah, 44 was still a widow and Laundress, born in Connah’s Quay, her sons, Thomas J., 24, single and a Cooper, Walter, 16, single and an Iron Worker and son Frank, 6 was a scholar. Her daughters were Marie, 13 and Lizzie, 11 were also scholar. A nephew, Ernest Massey, 26 and an Iron Worker, Labourer had been born in Queensferry as had all the children. UK, Soldiers Died in the Great War, 1914-1919 about Thomas John Massey tells us that his birth place as Queensferry, Flintshire, confirming the Book “Soldiers died in the Great War, R.W.F., Volume 28 above. It also tells us that he enlisted in Shotton. Marie & Lizzie were to go on and work at the Munitions Factory in Queensferry, where, no doubt, they would have been affected by the chemicals they worked with. UK, Soldiers Died in the Great War, 1914-1919 accessible on www.ancestry.co.uk confirms the information above and adds that he enlisted in Shotton. His medal card, also on ‘Ancestry’ details his medals and says that his first Theatre of War was France and his entry therein was 2nd December 1915. He was killed in action on 10th July 1916, just over 7 months later. Thomas John Massey in the UK, Army Registers of Soldiers’ Effects, 1901-1929 tells us that the sole Legatee was his widow Edna May MASSEY who was paid £3.8s 6d on the 6th December 1916 and his War Gratuity of £7. 0s 0d on the 22nd October 1919. 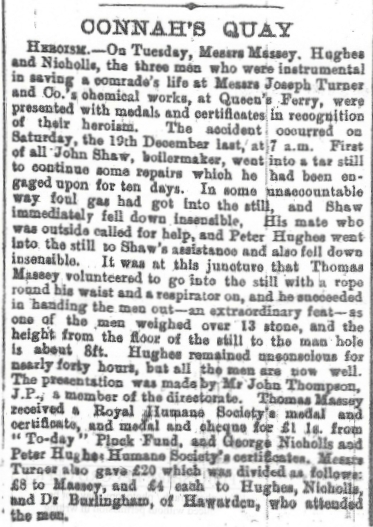 Thomas Massey is also remembered on the Queensferry Chemical Works Roll Of Honour that is in the Hawarden Record Office, it is a list in a Frame. I was given a photo of his medals that had been loaned to the record Office at Hawarden and then withdrawn, the picture is not of good quality, but interesting just the same.